Birrarung Marr, on the Yarra River's north bank next to Federation Square, is Melbourne's newest major park. Opened in 2002, it hosts events and festivals. From Princes Bridge, the park incorporates three terraces of contrasting grass and sand. The Lower Terrace follows the curve of the Yarra River and retains sections of the original avenue of elm trees. Stroll along the banks of the Yarra River in Birrarung Marr Park, a modern park with an ancient history. With its riverside promenade, shady native foliage and architectural terraces, the 20-acre (8-hectare) parkland is a popular place for festivals and city events. Birrarung is the local name for the river in the Woiwurrung language of the Wurundjeri people and translates to 'Place of Mists and Shadows,' while Marr means 'riverbank.' Wander through the park and find its scattered public artworks or experience the exciting atmosphere during one of the park�s regular events. This image belongs to the travel and nature stock photo library. 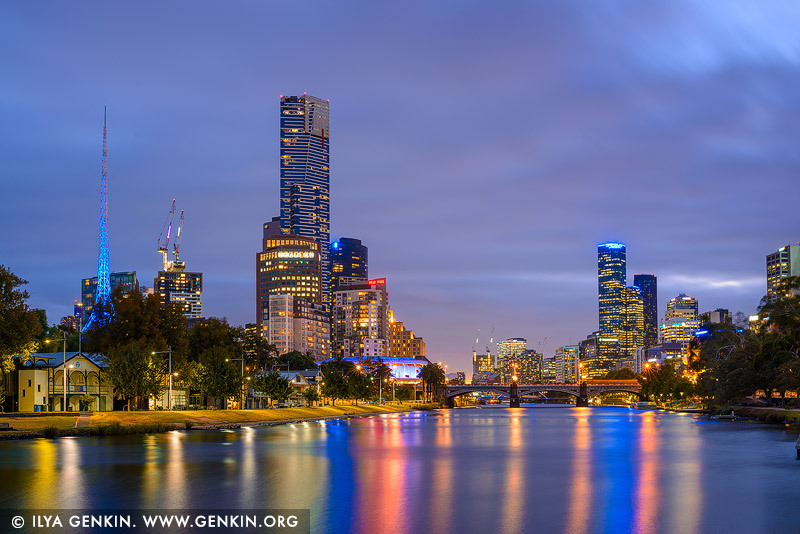 This stock photo of Melbourne, Southbank, Princess Bridge and Yarra River at Night is available for licensing for commercial and editorial uses including websites, blogs, books, magazines, brochures and advertising. Restrictions may apply for images which contain third party copyrighted material or sensitive subjects. Photos of artwork are for editorial use only. This image id AU-MELBOURNE-0019 of Melbourne, Southbank, Princess Bridge and Yarra River at Night, is copyrighted © by Ilya Genkin. This is not a public domain image.